Manchester United manager Sir Alex Ferguson has been banned from the touchline for two matches by the Football Association. 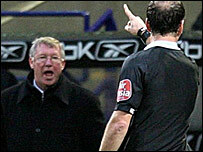 Ferguson admitted using abusive and/or insulting words towards referee Mark Clattenburg during the game against Bolton on 24 November. The ban starts on 28 December so the Scot will be in the dugout for Sunday's match against Liverpool at Anfield. Ferguson, who did not attend the hearing, was also fined £5,000. The Premier League champions will be without their manager for the trip to West Ham on Saturday 29 December and the New Year's day fixture at home to Birmingham. The United boss was sent to the stands by Clattenburg following a half-time rant during their 1-0 defeat at the Reebok Stadium. He said after the match that he had told the referee "exactly what he thought of him". He continued: "Some referees don't like it. They don't like the truth. But I just told him how bad he was in the first-half." Ferguson was upset with what he felt was a lack of protection for his players against what he claimed were "over-aggressive" tactics from Gary Megson's side. And one tackle by Kevin Davies on Patrice Evra prompted an infuriated Ferguson into a finger-jabbing rant as Clattenburg entered the tunnel at half-time. Ferguson said he believes refereeing standards are 'slipping' within the English game. How will United fare against Liverpool on Sunday? Though the United boss openly admitted he had missed a pre-season briefing for managers by referees' chief Keith Hackett, he believes one of the central components of the discussion has been ignored. "At the summer conference, Keith Hackett was on about tackling from behind," he said. "He made a promise to the managers that tackles with raised feet off the ground would be a red card and that tackles from the back would be a red card. "Standards must be slipping because there have been some bad tackles recently, not just in our games but in quite a few others. "And what happens then is that if someone gets seriously injured, who gets the blame? The referee gets the blame."